"We know that this is a strong and inclusive community," an LGBTQ-rights advocate said. "We need to make sure that businesses there respect these values." "I made the suggestion to put the flags next to the restaurant, and council members liked that idea but also said that maybe put flags elsewhere, too, like outside," Yeager said. “This is public space," Escobar said. "We know that this is a strong and inclusive community. We need to make sure that businesses there respect these values." Chick-fil-A has beenblocked from opening restaurants at two airports in recent weeks — at San Antonio International Airport in Texas and Buffalo Niagara International Airport in New York — over what some legislators and city council members have cited as the company's legacy of anti-LGBT behavior. 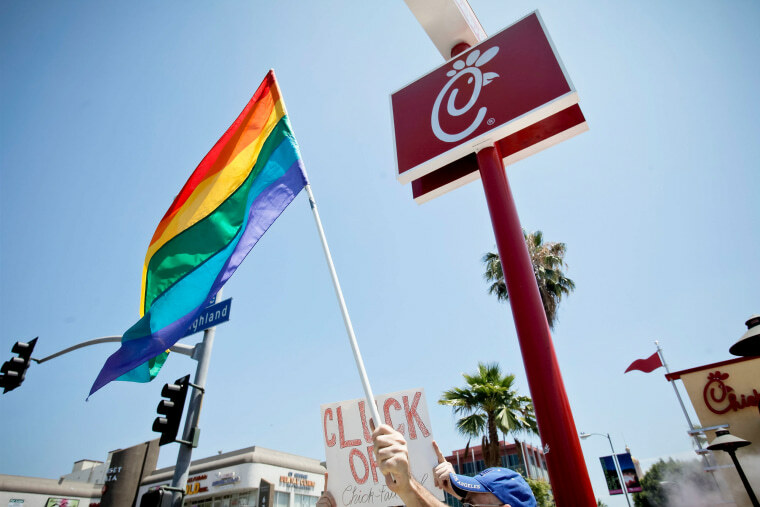 Chick-fil-A did not immediately return a request for comment from NBC News on the San Jose vote but said last week in a statement that “recent coverage about Chick-fil-A continues to drive an inaccurate narrative about our brand." "We want to make it clear that our sole focus is on providing delicious food and welcoming everyone — not being a part of a national political conversation," the company said.